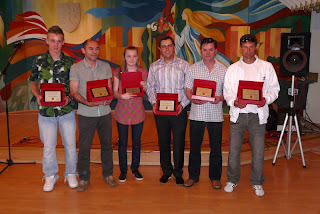 Top Award for J4K Student!!! One of Just4keepers most talented Goalkeepers has won one of the most prestigious awards in his home town of Vrable in Slovakia. Peter Pecho who is one the most athletic and talented goalkeepers I have seen in a long time recentley won the award of 'The Best Sportsman' in his city. J4K expect Peter to go and achieve huge success in his goalkeeping career and because he is not even 18 years old as yet, he still has a long time to get even better! Here is highly rated Goalkeeper Coach of Just4keepers and Derby County Jason Pearcey putting his goalkeeping students through their paces! And click: Goalkeeper coaching in Coventry to have a FREE GK training session with Jason. Just4keepers Goalkeeping Academy is proud to announce the launch of our new Goalkeepers Kit. 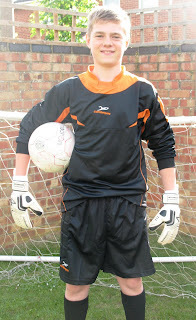 This is our VERY FIRST student Mitchell Leggett to wear our Goalkeeper outfit. J4K would like to thank Mitchell who is one of our up and coming students for being the first student to wear our goalkeeping kit. 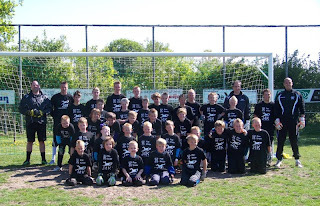 Marcel Ran a fantastic Goalkeeper course where 40 goalkeeper students where in attendance. This was held in one of the most beautiful places I have visited, Groningen, North Holland. The venue was excellent and the goalkeeper students where a credit to their parents and to Marcel who ran one of the best goalkeeper courses I have attended. Myself far left and Marcel far right with the J4K students of Groningen, Netherlands. This was a nice touch from Marcel. He had the English flag where J4K began over a decade ago and the Dutch flag. 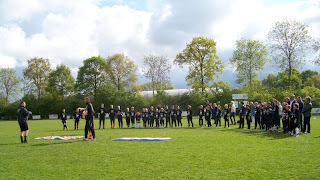 Marcel had a Goalkeeper diving from the English flag to the Dutch, as a sign that J4K is now very much in Holland. You are trying to concentrate on your game while playing and you have local kids using the back of your goal for their goal! This can be VERY off putting! Especially when they kick their ball on the pitch and they ask you to kick it back. If you have watched my videos on the importance of concentrating, you will understand that a little lapse of concentration for a keeper can result in a goal!!! It’s not worth you arguing with them and asking them to move (because some will not move). Instead pre-warn your manager, coach or parent. Explain what you have read here and that you want NOBODY playing behind your goal. If you can educate others that is not cool these guys using your goal as their goal when you play, hopefully these local kids will get moved on swiftly, allowing you to focus 100% on what you are doing!